The human oral microbiome is a complex site containing many hundreds of species with the community response of these species having a large effect on human health. The complexity of this site speaks to the need for applying -omics techniques to better understand which microbial species are present, their interactions and contribution to the microbiome, and how this may change as a function of disease. Here, I review several recent studies that use computational analysis to examine and model the oral microbiome and determine its role in human health. 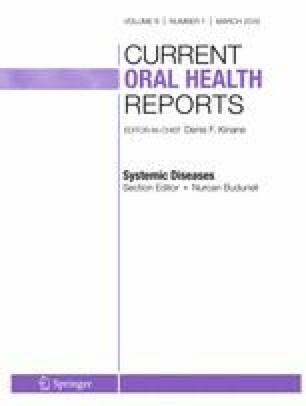 Several studies have emerged in the past few years that use several -omics approaches to look specifically at points of interaction between microbiomes of the oral cavity and between these microbiomes and the human host. New techniques in sequencing have revealed a more detailed picture of who is present and their interactions. Network studies that attempt to link hundreds of species, transcripts, or proteins are also beginning to be inferred though their use, aside from species co-abundance networks, are still in the early stages. The ability to collect -omics data of the oral microbiome has been well established. The future of this field will likely focus on the integration and use of this data to build models that reveal hundreds of interactions between species at the individual gene or protein level. A better understanding of these interactions, and how they contribute to disease states, will allow for better control and manipulation of the oral microbiome to improve human health.